The New York Mets: It’s Gotta Get Better, Right? There’s a lot going on in Met-land lately, but I’m finding myself hard pressed to pay attention. There’s talk of new uniforms next year…again! 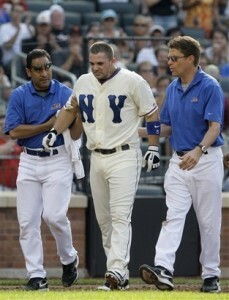 If it’s to be a ditching of the tired, oh-so-90’s “Mets In Black” look, I say “Hear! Hear!” I could go through the rest of my life with only the home cream-and-pinstripes and the grey roadies. 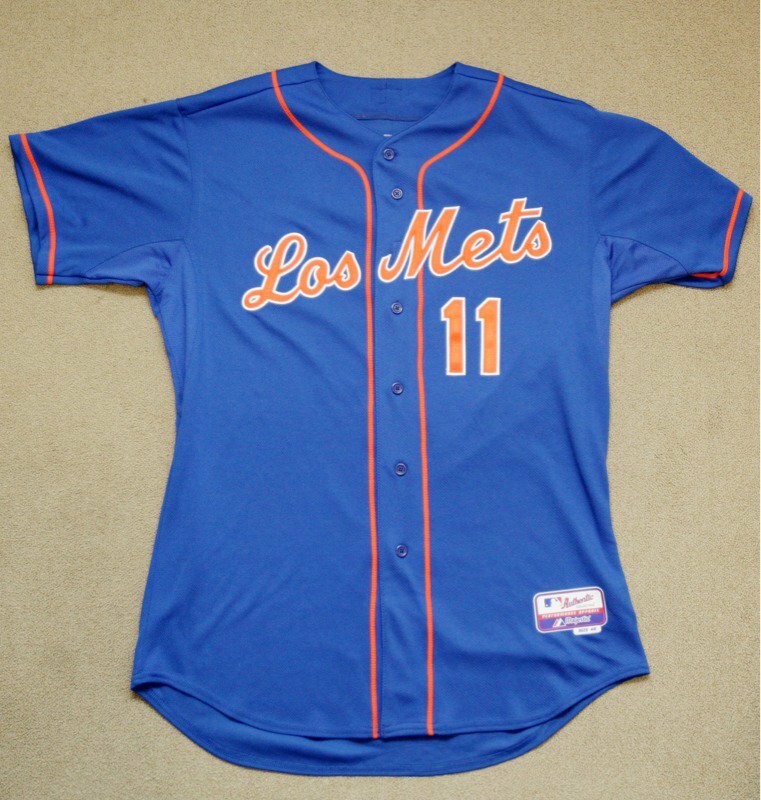 I could even deal with the royal blue tops — sported by Los Mets a couple of weeks ago – sprinkled in here and there. Maybe the alternate jerseys from a couple of years ago with the ginormous “NY” on the breasts could make an appearance as well. There are murmurs that the outfield walls might have kinder, gentler dimensions commencing in 2012 as well. There’s only so much that can be done, here: there’s an awful lot of concrete to be dealt with. I’d be in favor of lowering Great Wall of Flushing (thank you, Howie Rose!) from sixteen feet high to a more humane eight. I’d also welcome abolition of the cursed “Mo Zone,” where homers go to die. It’s interesting that the park was seemingly built with Carlos Beltran and Jose Reyes in mind, neither of whom – possibly – would enjoy its fruits past 2011. This is all well and good. Those deck chairs on this Titanic will be in perfect position. This is the definition of window dressing, designed to take our minds off a most depressing present. Yes, I have faith in Sandy Alderson. He’s saying all the right things and it looks like he and his squad are making all the right moves. We out here in the fan base are drooling over the prospect of Matt Harvey and Zack Wheeler becoming the new Seaver/Koosman and Brandon Nimmo launching balls over the erstwhile Mo Zone. And yes, I like what Terry Collins is doing in that room. I know the win tally is worse than Jerry Manuel’s final, fitful kicks last season, but Collins is doing what he was brought in here to do: fumigate the clubhouse. When he was hired back in November, I mentioned that this was most likely a tenting operation, designed to exterminate the funk emanating from Roosevelt Avenue. He seems to have done that. There are signs on the field – despite the stagnant win total – that this franchise is closer than we think to ascending to contention. The only game in this losing skein that was truly putrid was last night’s (8/22). They’ve been in almost every game they’ve played this year, and I think that says a lot about character, something that to the naked eye was absent from June 2007 through last year. No. My concern is that all this window dressing we’re seeing right now is meant to distract us from the fact the old, fetid ownership is still in place and will remain so through the end of the 2011 season – and most likely beyond. I know there’s an Einhorn waiting in the wings, but the process is maddeningly slow and we have to watch the Wilponian dog-and-pony parade before anything of substance will shift. I have a fear that the longer Fred and Jeff Wilpon hang around, the greater the chance that all the good work of Alderson and co. will be undone by desperation and stupidity up in the tower. ← Mets Minors: Brandon Nimmo the next Josh Hamilton? They could go back to their 70’s pullover polyesters for all I care if they gave us more W’s. The Mets will not improve their record in 2012 until the pitching staff is upgraded and the pitching coach is held accountable for the degression of the current staff. Looking at things through rose colored glasses they have three #3 starters and two #5 starters. Their best pitcher may never pitch as a #1 again so you have to have a Plan B. Pitching wins. The bullpen is in dire need of a total overhaul. I’m not worried about the offense especially if they relegate Bay to the righty platoon bench player that he profiles for. Without pitching they are not on the same playing field as the Phillies or Braves. 2013 begins the young pitchers arrival but remember it usually takes 2-3 years to establish yourself. Yes it’s going to get better but maybe not enough to satisfy the general fan base. And yes, the blue uniforms are sharp and the playing field needs to look more like a big league ballpark with maybe just one quirk for character.